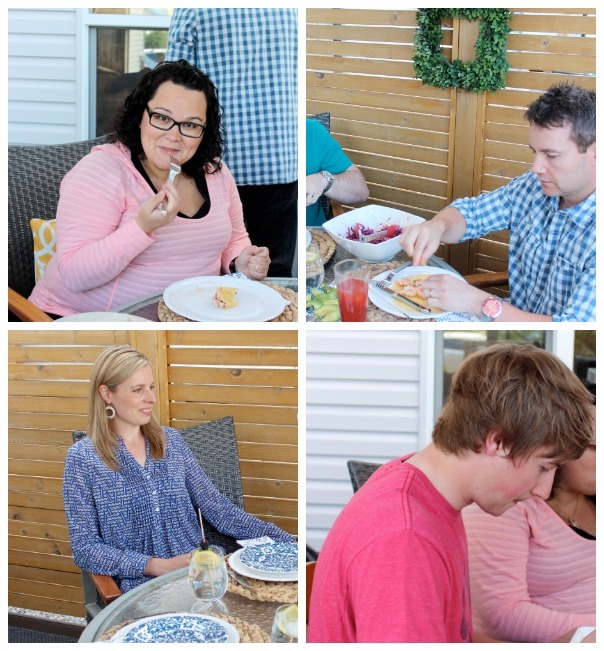 Hosting an outdoor get-together this summer? 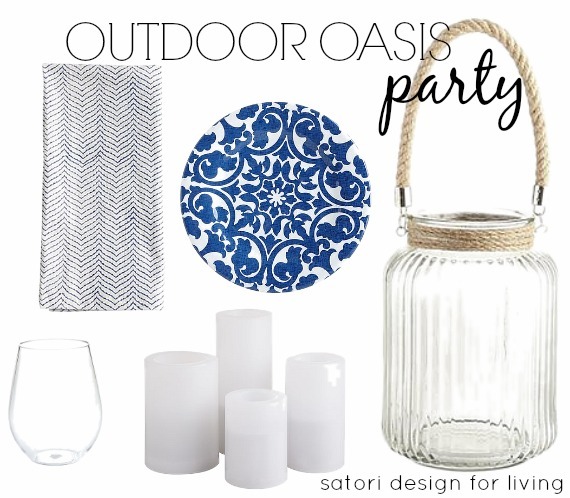 Get tips from our Outdoor Oasis Party! As soon as the weather turns warm, we spend as much time outside as possible. I like to think of our backyard as an extension of the rest of our house. It’s an oasis where we can escape the busyness of life, take time to rejuvenate, and reconnect with friends and family. Disclosure: I participated in a campaign on behalf of Mom Central Consulting (#MC) for Pier 1 Imports. I received a product sample to facilitate my review and to thank me for participating. Post contains affiliate links. 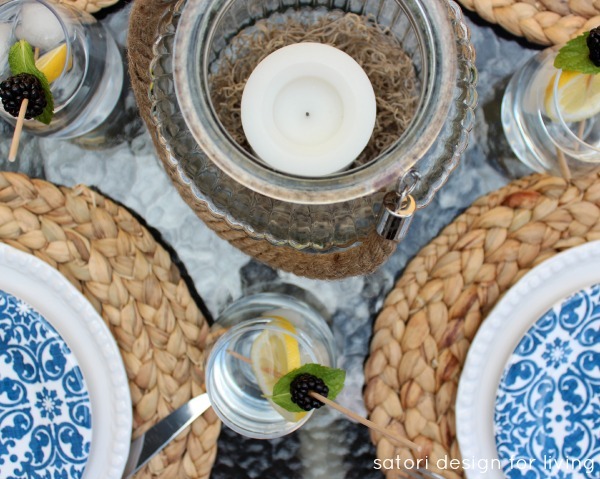 When the opportunity to host a Pier 1 Imports outdoor oasis party arose, I jumped at the chance. This kind of thing is right up my alley. For me, an outdoor oasis is all about an easy-breezy, beach-inspired setting. Colors of driftwood and sand form the perfect backdrop to watery blues and aqua, with pops of sunshine yellow. On my party-planning shopping trip, I immediately found my jumping off point for the table setting. 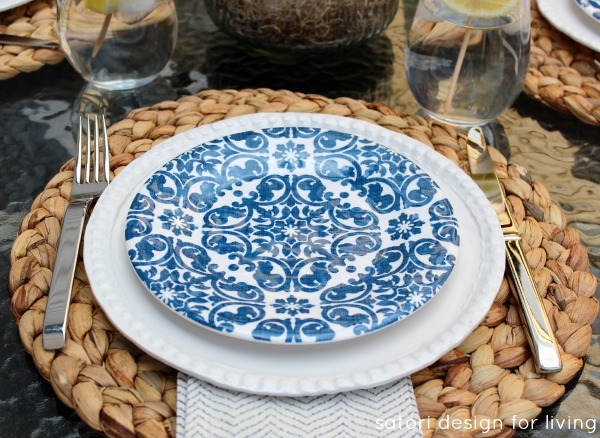 Having woven seagrass place mats and plain white dishes at home, I knew these gorgeous blue and white trellis melamine salad plates would be the perfect complement. That’s what I like about basics, they’re easy to dress up without spending a lot of extra time or money. For function and added interest, I chose these blue and white chevron napkins. Small-scale patterns always seem to mix well with larger-scale ones, don’t they? For water glasses, I found these worry-free acrylic stemless goblets. Can you believe they’re not glass? Perfect for wine and cocktails on our stone patio too. 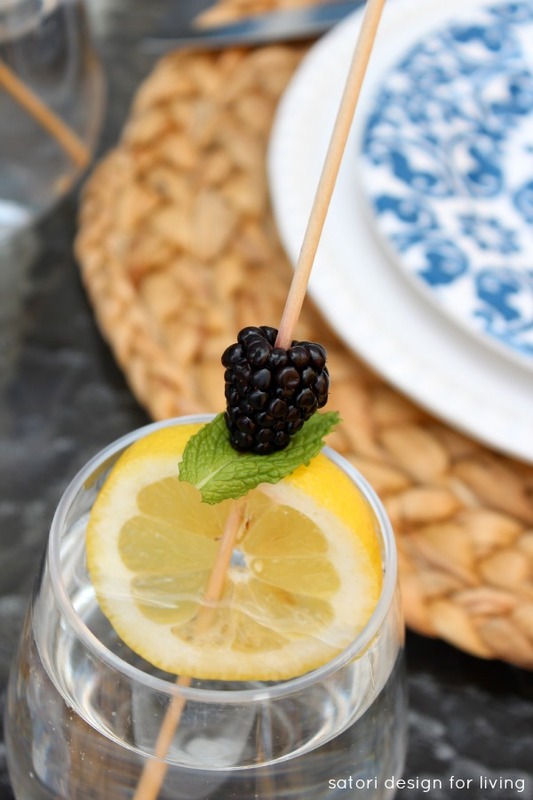 I always like adding fruit and herb skewers to my water glasses- so fresh and pretty! For a bit of sparkle, I chose a jute handle glass lantern for the centerpiece. I love how classic and versatile these decor pieces are. Having various sources of lighting outside is essential for evening entertaining. Using outdoor flameless candles, especially when spanish moss is involved, means we’re able to focus on our guests, not potential fires. I love that they’re on a timer too! 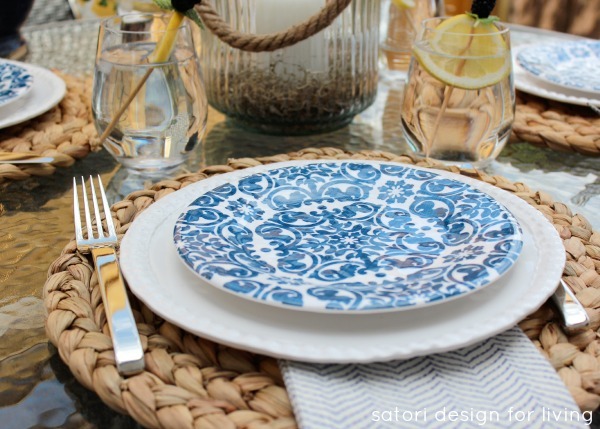 One stop at Pier 1 Imports, and I was able to get all of the pieces I needed for our coastal-inspired tablescape. Easy-peasy! Summer dining for us is all about keeping it simple, just like the decor. Items that are able to be prepped ahead of time and thrown on the grill when we’re ready to eat are must-haves around here. 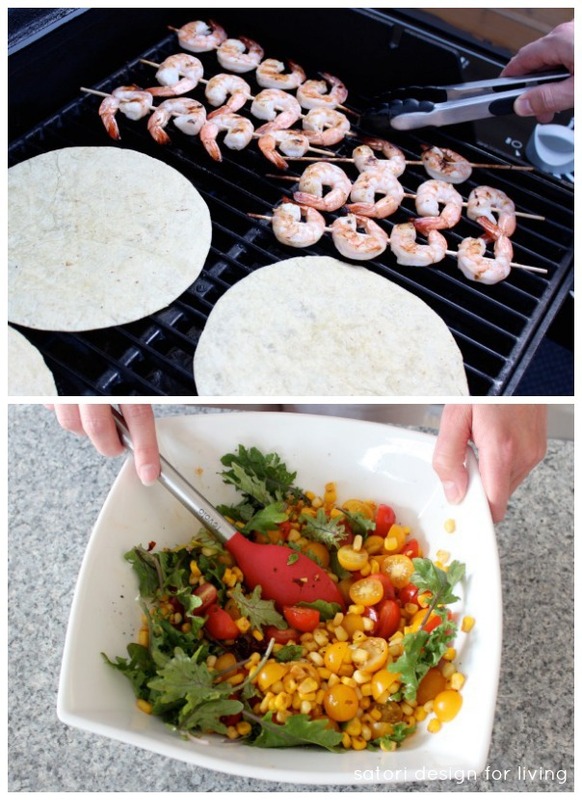 This time, tequila shrimp tacos, along with a toasted chipotle corn and tomato salad were on the menu. Our guests enjoyed the bold and fresh flavors of these dishes as much as we did. Definitely recipes we’ll be throwing together again this summer! Luckily, the weather held out long enough for us to finish our dinner outside. S’mores around the fire are what we prefer for dessert throughout the summer, but rain meant improvising and making them in the oven. A couple minutes under the broiler and we were set! Being flexible and enjoying the moment is what hosting a successful party is all about anyway, wouldn’t you agree? Can’t wait to do it again! One gift card per person may be won from Pier 1 Imports during the duration of this campaign on all participating blogs. This giveaway will end on June 16, 2014 at midnight EST. Winner will be drawn via Rafflecopter. Winner will be contacted by email and will have 48 hours to reply before a new winner is drawn. Open to Canadian residents (void where prohibited). Winner will be posted in the rafflecopter widget after confirmation is received. Gorgeous Shauna! I love the soft coastal colours and textures…very very nice! I like the Ciudad mocha barstools. They’re lovely. I love what you picked – it looks so pretty and beachy! It seems like Pier 1 has really stepped up their game. 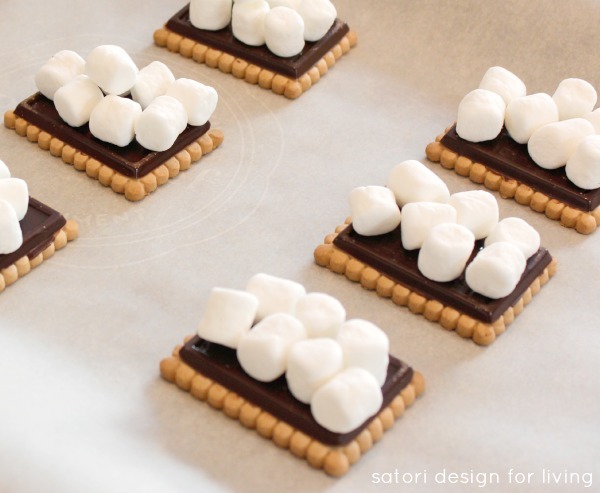 Also, I am totally making oven smores today. YUM. I like the Jute Handle Glass lantern! I love the blue glassware. Oooo, I love flameless candles! Especially with my kids around. Lovely table setting, Shauna! I would love this look for my summer outdoor entertaining! The blue and white plates are my fave!! i love Jute Handle Glass lantern!!!! I would love the Isabelle End Table! i would like the Citronella Sizzlewick™ Candle – Yellow. i love a candle with a purpose. WOW! Those plates are so pretty and I adore those fancy drink skewers! Your table setting looks beautiful Shauna, I like the coastal feel to it! It looks like you had a lovely time too, the food sure looked great! 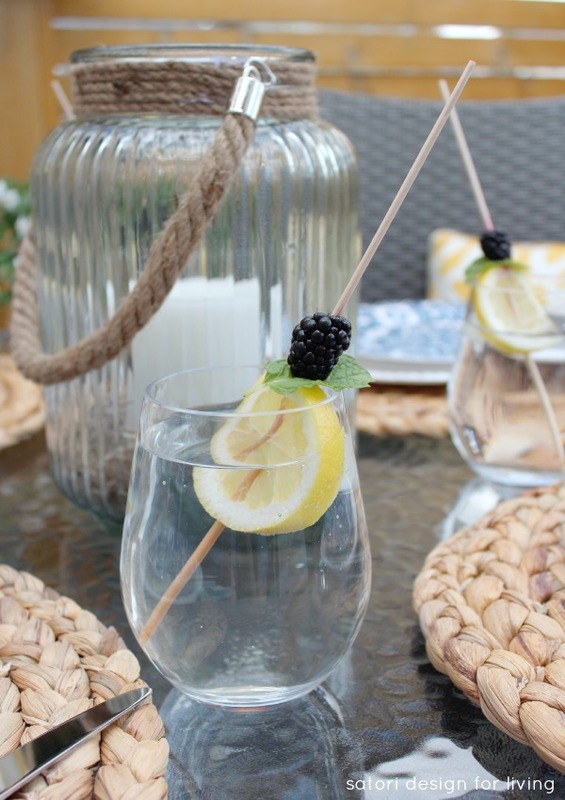 They have a gorgeous drink dispenser that I’ve been eyeing … perfect for summer entertaining! The barstools are practical and cool simultaenously! In the The Ciudad Collection , I like the Bistro Table. I like Citronella Sizzlewick™ Candle – Turquoise. They have some placemats I’ve been eyeing! Ciudad Chaise – Mocha is very nice. I like Santa Barbara Dining Bench – Light Brown . Lovely tablescape, great look and mix of patterns! I want that lantern really bad! 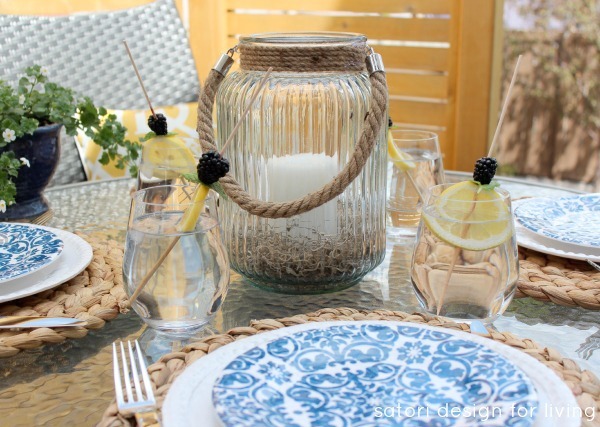 The citronella mason jar candles! I need some of those! Gorgeous table Shauna! Love love love the lantern! I like the Santa Barbara dining chair. As always you did a wonderful job of styling Shauna! 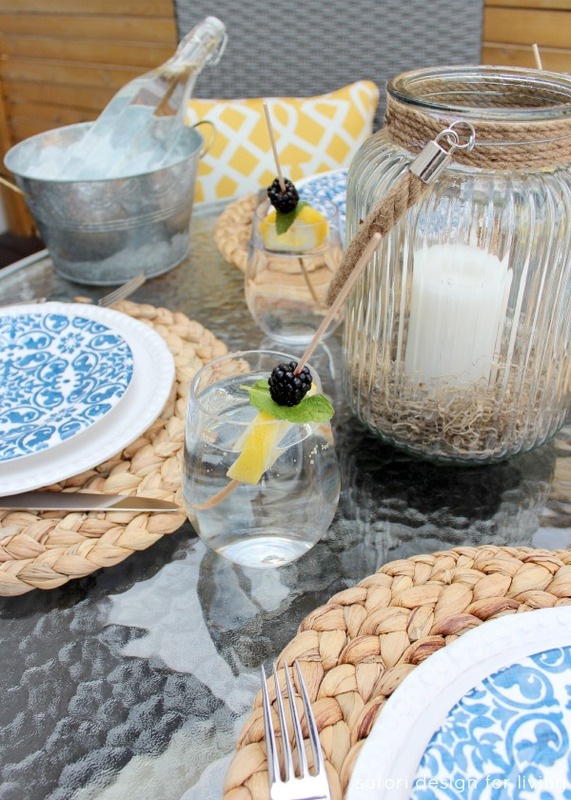 I love those woven placemats and the shape of the glasses you chose is perfect for so many summer drinks… off to Pier 1 I go!! I would love to have the blue Rania table. I would love the Calliope Dining Cushion – Spice! I;d get Aluminum Tilting Umbrella – Sand. Love the black Montauk lanterns for my patio. I would love to have the Yellow Outdoor LED Candles! Jute handle glass lantern would be a nice thing to have. Oh how beautiful– you did a great job decorating for your party. I love that neutral color scheme! What a pretty tablescape and your food looked so yummy! If I won, I’d choose some acrylic cups and the Kaleidoscope Jute Trim Pillow in Clay! It’d be nice to host a fun 4th of July brunch or playdate at our house. Thanks for the opportunity! Love the White Crackle Lanterns and Whimsical Garden Hammock! I love all of your decor touches for your party Shauna!! Love, love, love that jute handled lantern – swooning!